I’ve been doing reviews of gaming mice and other gaming peripherals on and off for over 5 years and I been owning gaming mice for at least 11 years, having owned around 50 different gaming mice, plus owning and testing many others that didn’t qualify. It’s rare that a mouse can surprise me anymore. But the new Logitech Pro Gaming mouse distinguished simply by “Pro” on the box, blew me away, so I simply had to do a review. 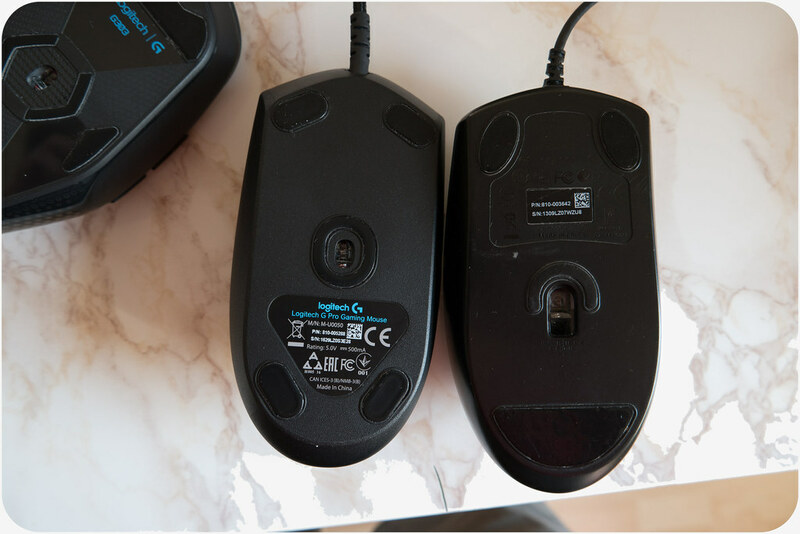 The Logitech Pro gaming mouse is shaped almost identically to the Logitech g100s and the g100, which has proven to be one of the most beloved shapes ever since the release of the Logitech mx300 released in 2002, and later the Logitech g3 and the Logitech g1 with quite similar shapes and was released in 2005. However as you can see here It’s not shaped identically to the g100s. The sides on the g100s is more || while the Pro gaming have a more \ / giving a better grip. 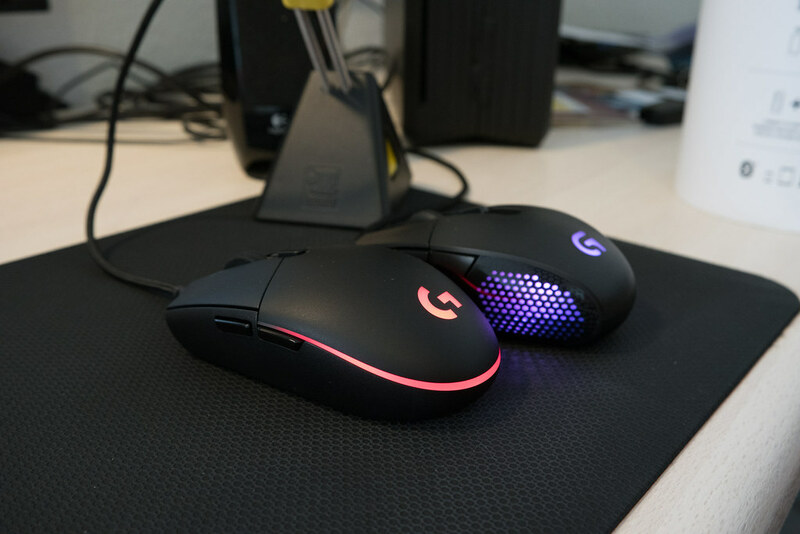 It also makes the Pro gaming feel smaller, because it have a smaller footprint at the bottom and also have smaller mouse feet which also leave less surface that is actually touching the mousepad making the Pro gaming move quicker as well. 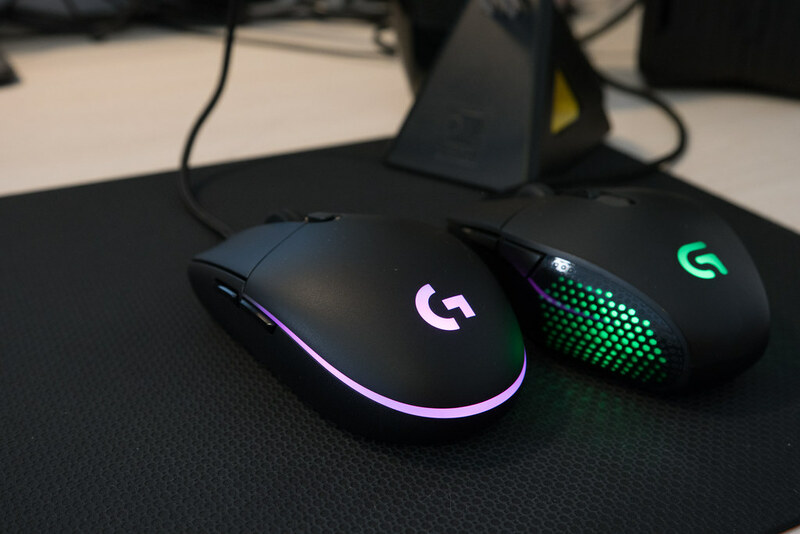 Comparing the g303 and the Logitech Pro gaming, the g303 is quite a bit wider because of the diamondshape. 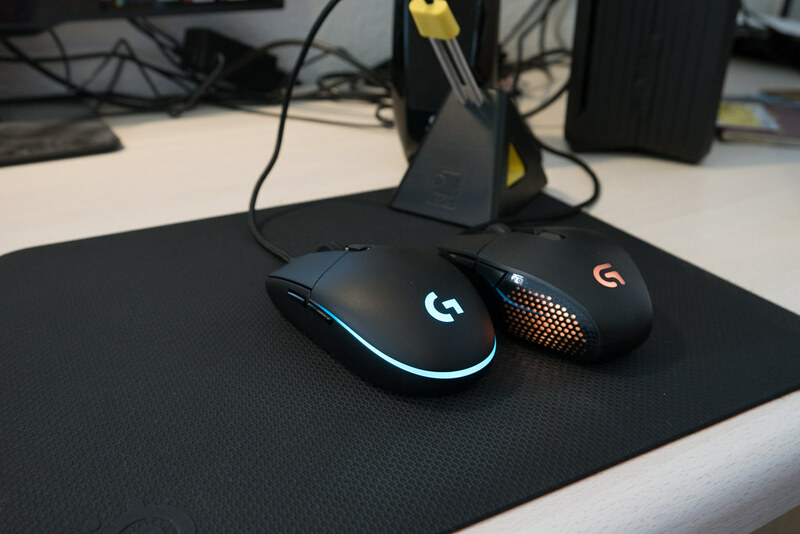 The bottom of the g303 is like the Pro gaming significantly smaller than the top part which also makes the g303 feel smaller than the g100s. However the g303 weighs 4 grams more so despite the small footprint it doesn’t really move any quicker than the Pro gaming. If you are asking me what the most important thing when choosing a gaming mouse, I’ll always say the shape, and the Logitech Pro gaming mouse definitely deliver a very safe and comfortable shape that you can use, not only as gaming mouse, but also for everything else. Is it the perfect shape for me for gaming? Both yes and no. Yes because I can use this mouse all day for gaming, without feeling tired of having any sort of pain or discomfort. Where the shape lacks a little is when you have to lift up the mouse a lot, like in the case of using a low sensitivity in fps games. This could be fixed with textured rubber grips like Razer or Mionix are using, or steeper sides \ / . 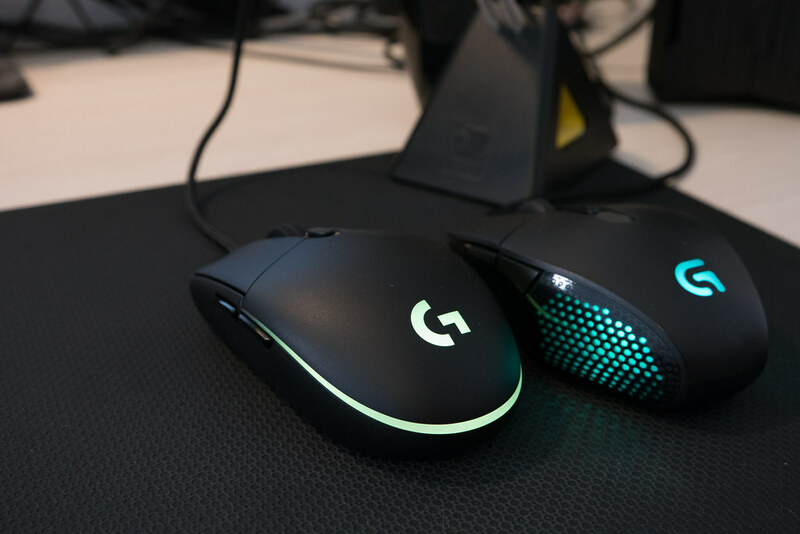 For lifting the mouse a lot the g303 shape is better, but in every other case the Pro Gaming shape is a much better choice. So comfort wise it gets a 5/5 from me. This is a great mouse for small-medium sized hands. If you have small hands, then pretty much any grip style will fit it. If you have medium sized hands it will work for claw or fingertip. While palming the mouse is possible this is definitely a mouse made for claw or fingertip. For RTS and Mobas this is the most perfect mouse I have ever tried. The design and comfort is perfect for these kind of games so another 5/5. For FPS gaming it gets 4.5/5. While there’s nothing wrong with the shape for FPS gaming, there’s other mice which are easier to lift if you are a low sensitivity gamer. As for looks, it follows in the footsteps of Logitech’s recent products like the Logitech g810 and the Logitech g610 gaming keyboard. With the lights turned off, it wouldn’t look out of place at work. With lights turned on it’s just beautiful. I’m really loving the minimalistic and simple design of this mouse. 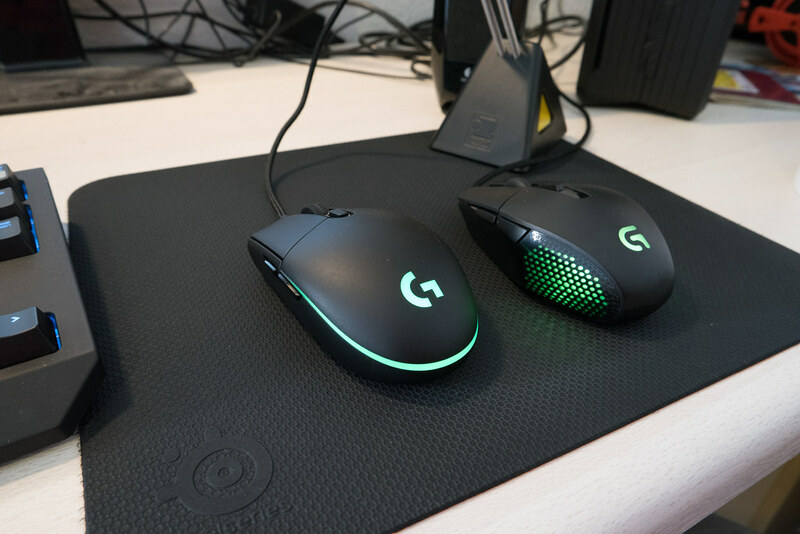 That said, the g303 does gets more attention and stands out more because of the shape and honeycomb design. Here's a few pictures to show how they look compared to eachother with lights on. There's plenty more down in the gallery. This one is recorded in a little dimmer light just showing my favourite lightning mode, the color cycle. 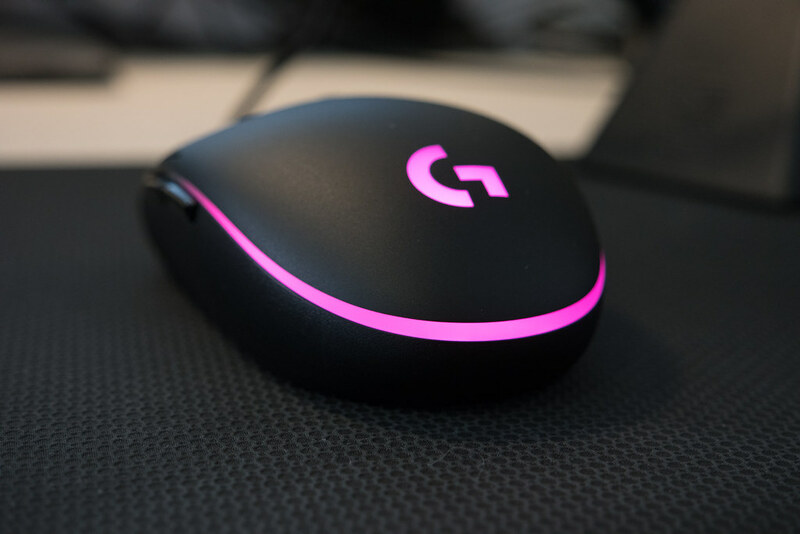 The scroll wheel have a very similar feeling to the one in the g303 in terms of the feedback you get when scrolling, which makes it one of the best scroll wheels out there. It’s very quiet and the scrolling feels very smooth. The tactile feedback is very light but easily felt. Both the g300 and the Pro gaming have the best scroll wheels of the mice I currently own. 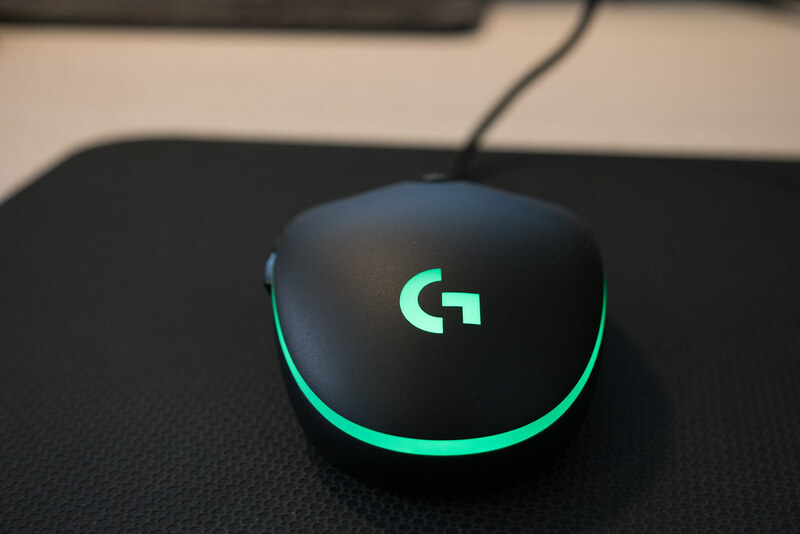 The only scroll wheel I like more comes from another Logitech product, the G502. The big metallic scroll wheel with a great amount of tactile feedback and the option for hyperscrolling just feel amazing. All Logitech scroll wheels just come with one drawback. They require a lot of force to press, and while it stops you from accidently pressing the scroll wheel button I feel the force required to actuate the button is too much. Cm storm spawn, Logitech g303, Logitech Pro Gaming, Logitech g100s, Mionix castor, cougar 450m, ninox aurora. In terms of the audible feedback, you can hear it here and judge by yourself. The g303 have have my favourite mouse buttons of all mice that I have ever tried, and since the pro gamings mouse buttons feel almost identical it, comes in at a close second. They won’t feel tiring during mobas or other games where you constantly have to press them, yet you won’t accidently press them in fps games either. The side buttons are great. It’s easy to press them when you need to but hard to press them when you don’t want to. They have a short travel and a reassuring feedback. In terms of build quality, I it justifies its price tag. 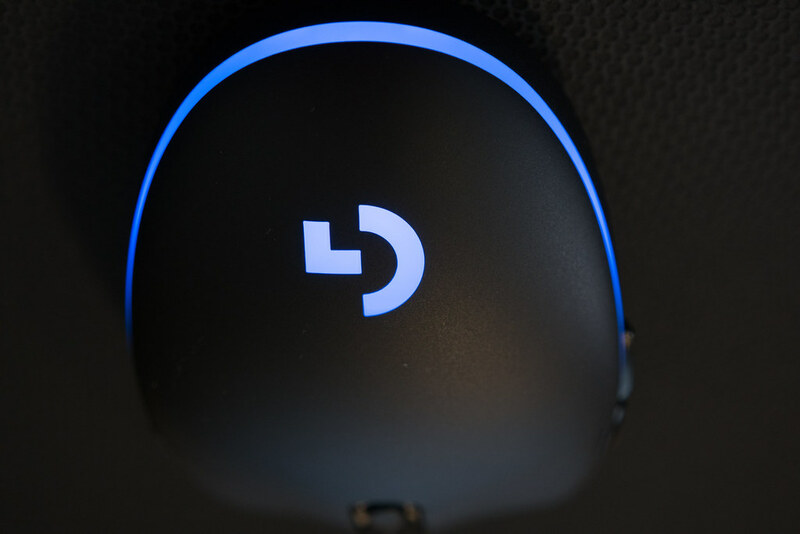 There’s no rattle like in the Logitech g303. There’s no squeaky or any other kind of noise that shouldn’t be there. The mouse is uncoated, so that the coating won’t fall off. The main buttons are separated from the shell and have a very consistent feeling throughout the button area so they are unlikely to break. They are omrons rated at at least 20 million clicks so they will last for a long time. And yes I did say that it’s uncoated. Usually having the mouse uncoated is something you don’t want because it will be very hard to get a good grip on the mouse like in the case of the Cougar 450m that I own. 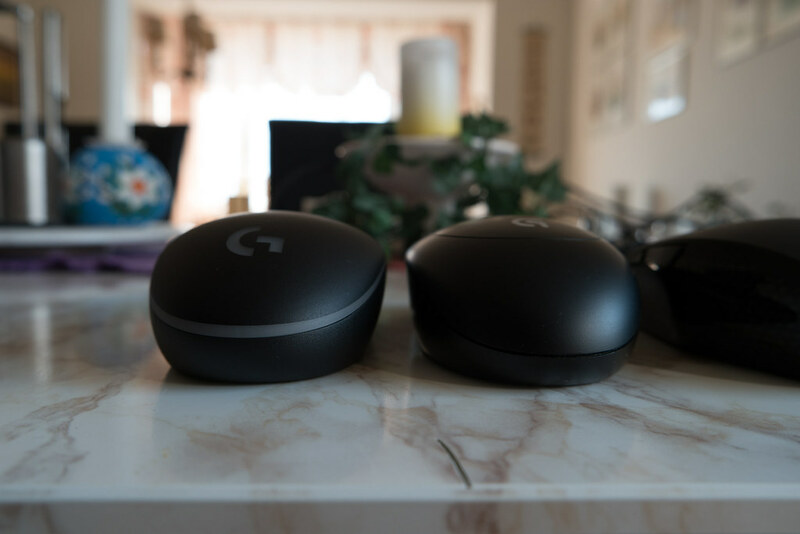 The Logitech pro gaming is uncoated but made in a different material that both feels very nice, provide a good grip both while having dry and sweaty hands and importantly the coating won’t come off. 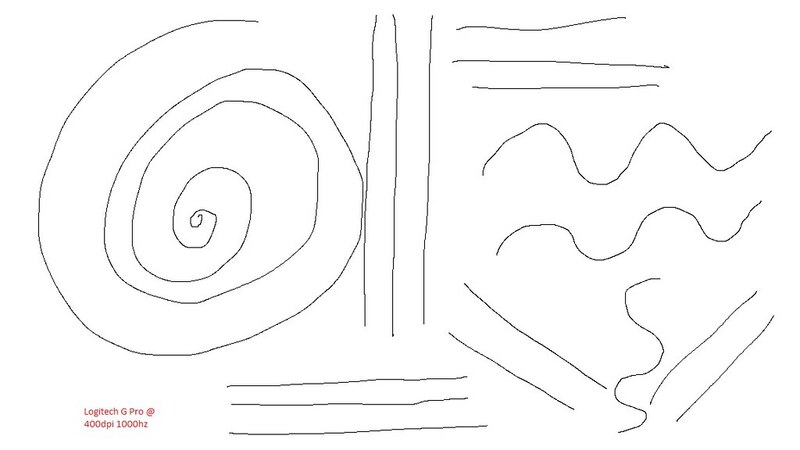 In terms of prediction, jitter and so on, there’s none of it! The sensor truly make the mouse feel like an extension of the hands. You can however turn angle-snapping prediction on in the Logitech Gaming Software if you feel the need to. In terms of lift off distance its already very low, but if you want the lowest possible lift off distance you can use the software and use “Surface turning”. That will set the lift off distance to very low as well as tuning the sensor to the surface you are using. I found that doing so didn’t give any benefits in terms of sensor performance but did lower the lift off distance. The sensor unsurprisignly have around 0% acceleration. I’m using the 8.87.79 version of the Logitech Gaming Software. The Logitech Pro gaming can do anything that any of the previous mice using the PMW3366 sensor. When you first open the software you have the option to either use the profiles stored on the mouse or use profiles stored on the computer. I always use profiles stored on the Mouse since, I want to have the same settings on any computer that I use the mouse. On the “Customize on-board profile” you can change the functions of all the mouse buttons. You have the options to have up to 5 different dpi settings, which is more than plenty if you ask me. I like to keep it to 3, the first one at 400 for fps games, second one at 800 for moba games and 1400 for desktop use. You have the options to assign a default dpi value, to have a default value it will use when you first turn on the computer or use the mouse in another computer. You have the option to “Assign shift” which will let you quickly switch dpi levels quickly during a match and then switch back to the dpi level before. This can be useful for fps games where you might want a lower dpi level when using a sniper. You can change the dpi in increments of 50 from 200dpi to 12000dpi, and you can change the polling rate if you want to. But there’s no reason to ever keep it lower than 1000hz unless you are using a very slow computer. On the “Lightning Settings” page you can choose how you want or don’t want your mouse illuminated. There seem to be only one LED in the mouse for lightning effects so if you turn off the Lightning effects for the logo the lights will be completely off. In the lightning effects you have the options to choose between “Color cycle” which cycles through all possible colors the mouse can do, where you can also choose the Brightness and at what rate it cycles through all the colors. The Breathing effect will let you a breathing effect where the lights slowly turns on and off giving the effect of the mouse is “breathing”. You can also turn lightning effects off which give you the option to give the mouse a solid color with no effects at all. For some reason when you do that you can’t adjust the brightness. All the light effects look really beautiful with nice and clear colors, helped by the really good print quality of the logo. At the “Surface tuning” page you can adjust the sensor to your own surface, which in my experience just lowers the lift off distance without any negative effect on the sensor performance. The factory default seems to be working with all surfaces but will give you a higher lift off distance. Logitechs own gaming surfaces are already included and preset so you won’t need to self-tune the sensor if you own any of those surfaces. At the “Input analysis” page you have the option to see a heat map of the buttons you have been pressing, in case you want to know what buttons you are using mostly. You can also see key presses per minute which is actually quite nice in strategy games, but otherwise it’s probably not something I will make very much use of. The Logitech Pro Gaming has solved every shortcomings of both the Logitech g100/g100s and the Logitech g303. The scroll wheel button is hard to press. 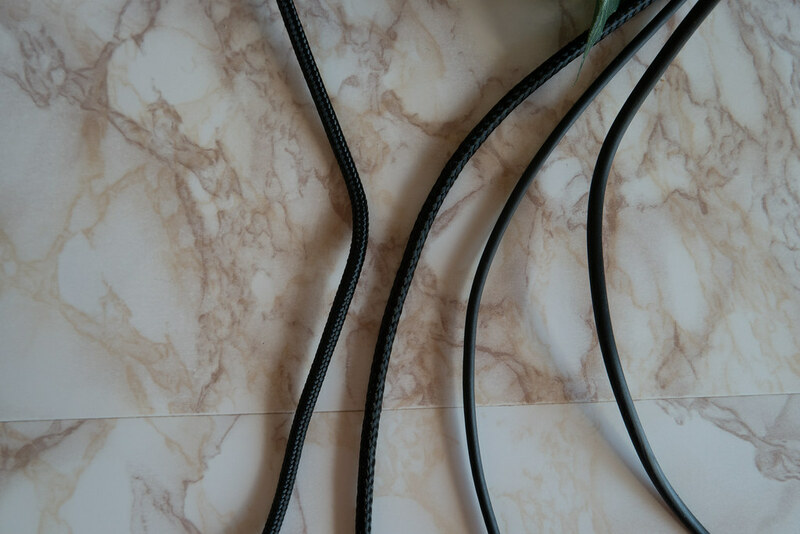 The cable could be thinner. But this is a non-issue for me since I’m using a cord holder. 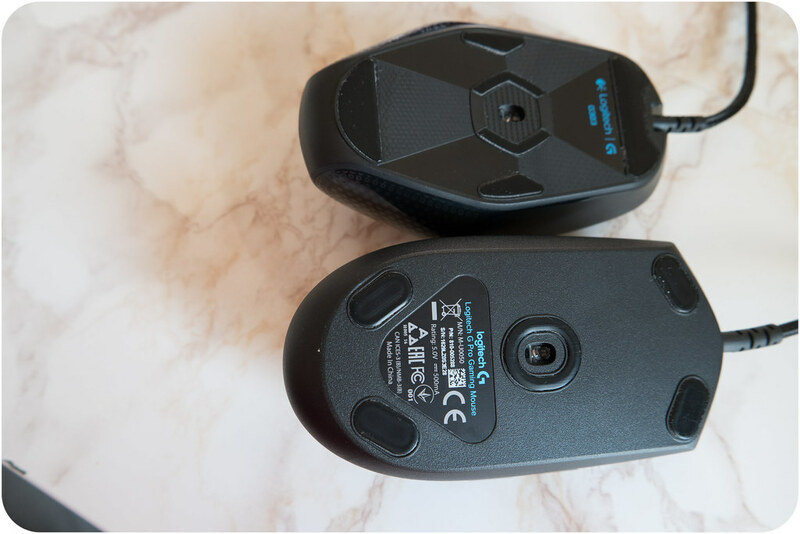 The Logitech g303 have slightly better feeling mouse 1 and mouse 2 buttons. 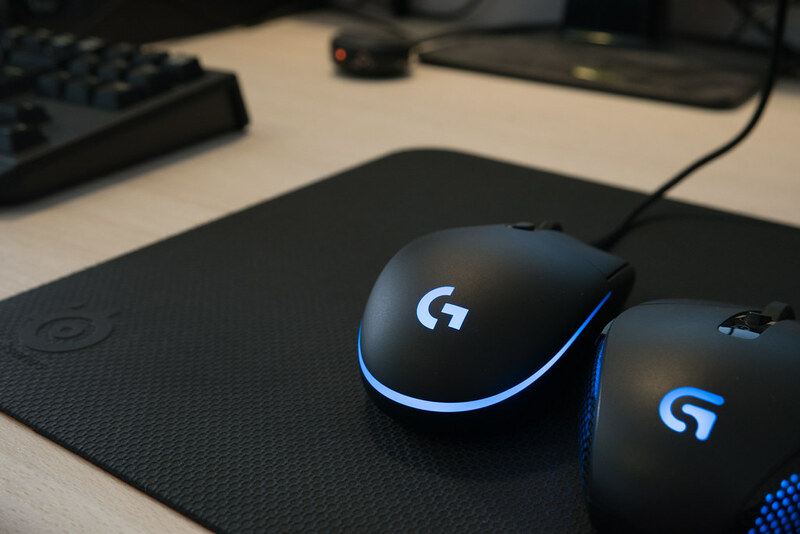 The g303 buttons feel slightly easier to press and have a more even pressure required throughout the button area. The Pro gaming feels easier to press in the front and harder on the back of buttons. While I have no problems lifting the mouse, I do need to add more force to lift it than for example the g303. This could be fixed by adding some rubber material on the side or make the sides steeper. Not sure if the last option would be comfortable though. I wouldn’t want this “fixed” in a future version if it meant the mouse would be less comfortable. So if you are using claw grip or fingertip, have small to medium sized hands and is willing to spent 69.99$/ 79.99€ then this is the most perfect mouse you are going to get. If you talk to animal rights or human rights organizations, they always say that their goal is to put themselves out of business. One would almost think that Logitech have the same goal with the Logitech Pro Gaming mouse, since people are going to use this mouse for maybe a decade without ever feeling the need to buy another mouse. Thank for the review, it's fantastic. Did you get the mouse as a review copy from Logitech? 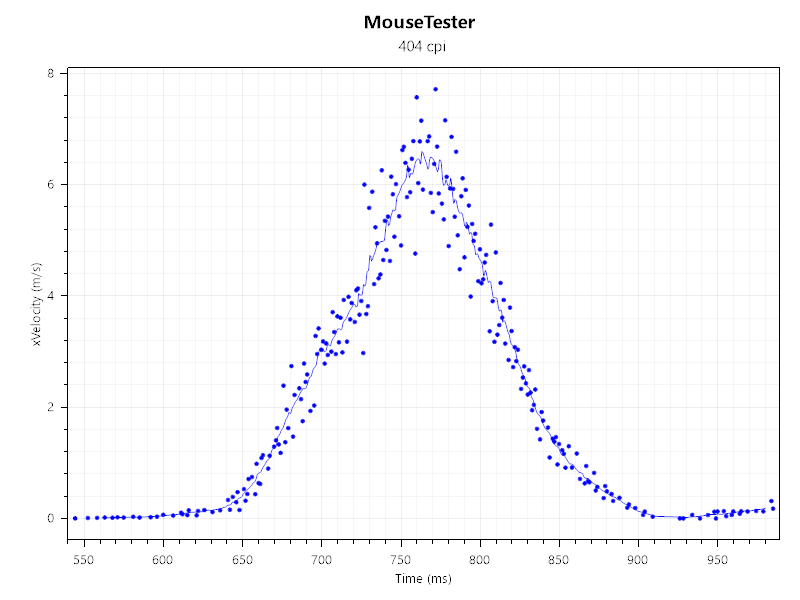 for mousetester, you should see if xcounts has a similar amount of noise. if so, then it's due to the mouse. if not, then the noise in the xvelocity plot is due to jitter from the OS. i suspect it is the latter in this case. Great review, thanks for taking the time. While I have no problems lifting the mouse, I do need to add more force to lift it than for example the g303. This could be fixed by adding some rubber material on the side or make the sides steeper. Very nice review, thank you for contributing. Good comparison. I like everything about this mouse aside from the side RGB strip. I will ordering min late Sept. I'm hoping I like the shape. The G900 with "G" logo lit up is perfectly simplistic and all that was needed. title says g101s. was that intentional? You do have a good grip. It's just not a easy to lift as with the g303, or some other mice. Yes they could've left that out, but I still think it looks great. I'm really loving the direction Logitech is taking in their designs. Yes I did compare the design and buttons with the g100s. I think everyone knows the pmw3366 is far superior to the Am010 sensor in the g100s so I didn't bother to compare the sensors.